Resources: Eat Positive. Be Well. Don’t get bogged down by heavy, overly repeated holiday desserts. 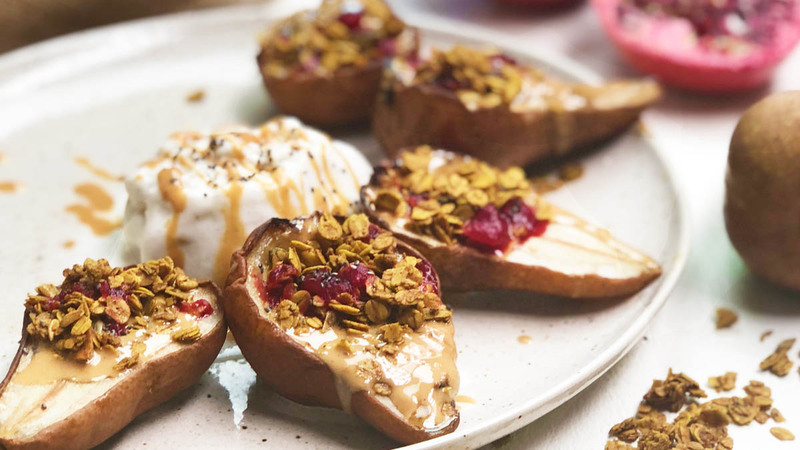 Our warm and toasty stuffed pears, lightly coated in real maple syrup make for a feel-good holiday dessert that is easily customizable for any palate or craving. 2. Wash pears, cut in half and scoop out the core in each half. 3. Brush the pears in a light coating of maple syrup and place on a baking sheet and roast for 20 - 30 minutes, until pears appear to be slightly squishy, but still hold their shape. 4. While roasting, combine cranberry, maple syrup and water in a small saucepan and simmer on low, stirring often, until a thick syrup is formed. 5. Once pears are done roasting, remove from the baking sheet and let cool. Fill each hallowed out pear with peanut butter. 6. Toss a handful of granola, and chia seeds, and cranberry reduction over all of the pears and enjoy with a serving of non-dairy vanilla ice cream. - Enjoy! New products, promotions, and more.